An eco-friendly tote made from Juco, a new and exciting material technology combining the strength and natural properties of jute with the finishing and texture of cotton fabric. 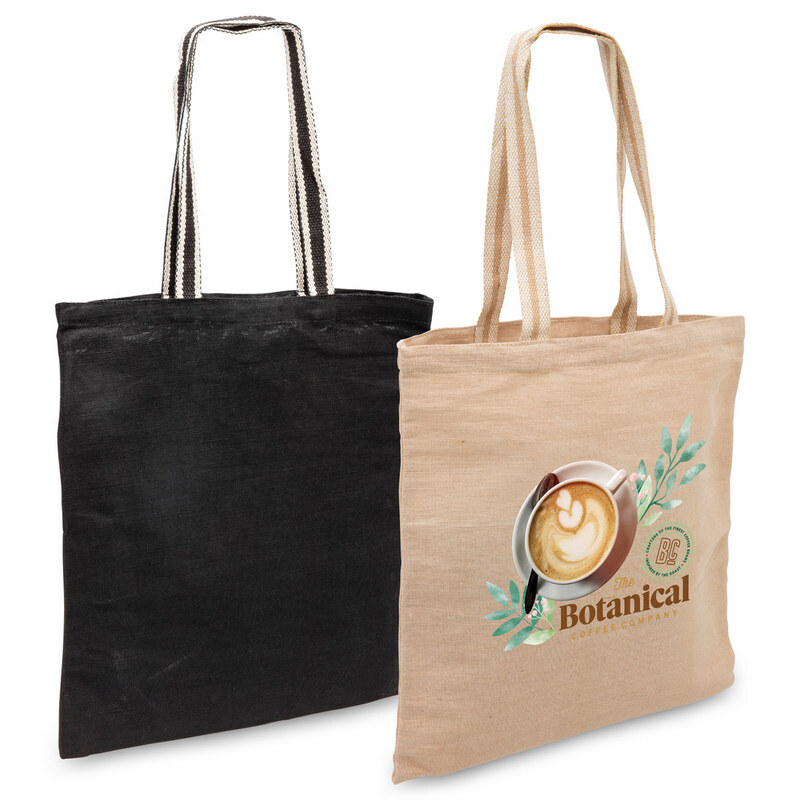 Product Features: Made of Juco - A fine-textured blend of jute and cotton (73% jute / 27% cotton) | Cotton webbing handle with colour feature | Large carrying capacity | Tough and eco-friendly renewable resource | Helps reduce the use of plastic shopping bags. Product Item Size: 38cm w x 42cm h. Colours Available: Black, Black | Natural, Natural. Decoration Options Available: Embroidery | Screen Print | Supasub | Supacolour. Decoration Areas: Embroidery Area, Front panel: 160mm diameter, Back panel: 160mm diameter | Print/Transfer Area, Front panel: 260mm w x 260mm h, Back panel: 260mm w x 260mm h, Bold artwork only - no fine lines or graphics | Supacolour Area, Front panel: 210mm w x 300mm h, Back panel: 210mm w x 300mm h.